Below is a gallery of some of the past winners for various owners of Scott Creek horses and a listing of each horse’s accomplishments. AMHA World Champion Jr Stallion. 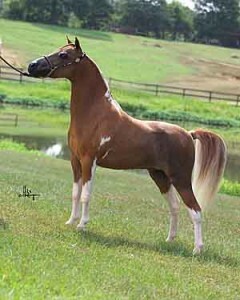 AMHA World Champion Amateur Stallion. 2004 AMHA World Reserve Champion Amateur Sr. Mare and Youth Senior Mare. Scott Creek Velveteen Patches was multiple Reserve World Champion and top ten open mare trained and shown by the outstanding young trainer, Casey Campbell. His little sister showed Patches to World Reserve Champion Senior Mare in the 13 to 18 year old highly competitive class. Joanne Ross repeated this win in her Amateur Senior Mare class. Patches is out of an outstanding champion Brewer’s Orion Mystic daughter, Scott Creek Mystical Fancy. Fancy was an all around mare winning top ten honors in halter, driving and hunter. Patches is by Lucky Four’s Little Kings Black Velvet. The 2001 AMHA World Grand Champion Jr. Mare. We are so proud of the success of this mare. With her striking bay color, Monique was the Unanimous Judges Choice for the loftiest title at the AMHA World Show. This mare embodies much of what our breeding program is all about. She is proportioned like a HORSE. Her lines are clean and her balance is impeccable. In addition to her outstanding structural correctness, this mare has fantastic movement. It stands to reason that great movement follows correctness. Her sire is a lifetime Leading Futurity Sire, Brewers Orion Mystic We want to congratulate trainer, Sheri Riedel of Meridian Training and owners, the Evans, on their great win with this beautiful mare. World Reserve Grand Champion Jr. Halter Mare, Scott Creek Mystical Dynachrome has been special to us from the day she was foaled. This fabulous blue roan pinto was born while we were hosting a neonatology class for the vet students of the Oregon State Veterinary College . Dynachrome was elegant afrom the very beginning. As a weanling she won Grand Champion Mare at the first show she attended. Chrome was the Western Region Champion Weanling Mare. She picked up a small cold so we did not take her to the World Show that year. We sent her to Melinda & John Eberth of Arion Management as a yearling. They did an exceptional job exhibiting her for us. Joanne showed her in her amateur classes, John showed her to the World Champion Yearling Mare 30″-32″. Melinda then showed her to the World Reserve Grand Champion Jr. Halter Mare title. We brought her home for a year then sent her back to be shown as a Senior mare. At 33 inches Chrome repeated her winning ways by earning the World Reserve Champion Senior Mare. Dynachrome is sired by Brewer’s Orion Mystic. Her dam is Crescent’s Geanelle, a daughter of Bond Dynamo. Scott Creek Reigning Monarch was purchased by Bel Aire Minis of France owned by Agnes Moitry. *2004 AMHA World Open Champion AMHA World Futurity Champion – Yearling Stallion under 28 inches *2005 AMHA World Open Champion & Futurity Champion – Yearling Stallion under 29 inches. Reigning Monarch was shown again in 2005. He repeated winning as 2005 AMHA World Open Champion 2 Year Old Stallion. Reigning Monarch was sired by our national champion stallion, Sierra Dawn Unos Monarch. His dam is a homebred mare named Scott Creek Mystical Ovation. Ovation was AMHA World Futurity Champion. 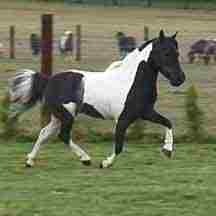 Her sire is our other fine stallion Brewers Orion Mystic. Reigning Monarch’s full brother is Scott Creek Standing Ovation who was 2001 AMHA World Reserve Open Champion & Futurity Champion – Yearling Stallion under 28 inches. Scott Creek Mystical Dandy is a 1996 colt sired by our Brewers Orion Mystic and out of our home grown mare Scott Creek Jessica Jubilee. Jessica was a three time National Top Ten Winner in her own show career. Mystical Dandy was shown at the 1996 AMHA National Show by our good friend and nationally recognized, west coast trainer Tiffany Porter of Avante Training. He was National Top Ten in the 28″ and under Weanling Stallions class. We have since sold Dandy to proud owner, Barbara Avery, Patchogue, New York. Barbara is the owner of Peppermint Stik Farm. Dandy repeated his National Top Ten winnings as a yearling and 2-Year-Old before being retired to Stud. Scott Creek Monarch Aplozz was purchased by Casey Campbell of Fairfax, California as a weanling in 2002 for a super gelding prospect. Monarch Aplozz was undefeated on the west coast in the Junior Gelding Classes. This year as a two year old he was crowned 2004 AMHA National Open Champion & Futurity Champion – Two Year old Gelding and National Reserve Grand Champion Open Junior Gelding. He had many top ten wins in youth, amateur and open with the Campbell family members. Monarch Aplozz was sired by our national champion stallion, Sierra Dawn Unos Monarch. In 2005 watch for him in the driving classes. This gorgeous little 28.5 inch mare is the pride and joy of Mr. Jim Jaeger, Bonney Lake, WA. She is sired by Brewer’s Orion Mystic and shows the “extreme” elegance, refinement, and proportion we are looking for. Believe it or not, this mare is only 28″ tall and maintains her proportion naturally. “Oreo” has been a repeat winner at the AMHA Nationals as a halter horse. She was National Top Ten Junior and also National Top Ten Senior Mare. She was an AMHA National Futurity winner as a yearling, two year and three year old. World Top Ten Amateur and Open Senior Halter Mare. 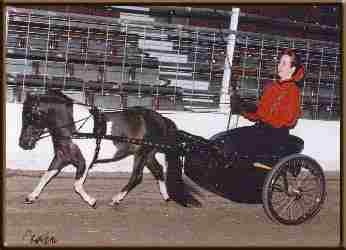 World Futurity Champion Pleasure Driving Horse. With movement becoming such a critical consideration in evaluating the over-all quality of miniature horses, we are pleased to be producing horses such as Mystical Belle that exhibit outstanding conformation as well as an exceptional way of going. “Fancy” is a once in a lifetime horse. 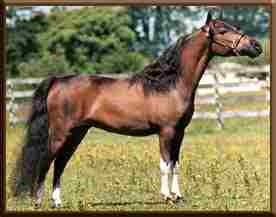 In his show career he has won just about every title there is to win in halter and performance. Many thanks to Jean and Kathy Howard and Jim Strawn for all the expertise they put into showing the full potential of Fancy Pants for all to enjoy. 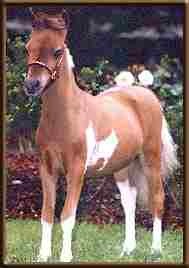 In addition to his exceptional conformation this little stallion has outstanding movement for a horse measuring only 28″. This is born out by his winning the Western Championship Reserve Champion Liberty Horse Title and undefeated in Northwest liberty awards. 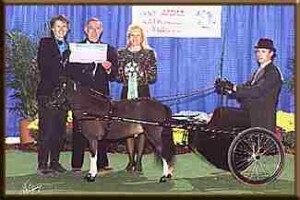 Owners, Jenny and Sam Stuart, Brooks, Oregon, were extremely proud of their fine stallion at the 1996 AMHA Nationals. He earned the title of National Champion Country Pleasure Driving Horse.